We recently set about programming our most ambitious event yet, bringing together three of our priorities: social justice, early years and youth voice. The result was a hard-hitting day of presentations, workshops and debate with a diverse range of people and organisations. 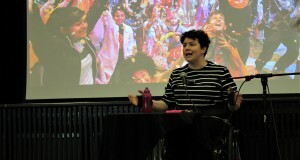 Jess Thom (Founder of Touretteshero) gave an incredibly evocative keynote celebrating the creativity and humour of Tourettes. During her presentation, Jess implored us to practice everyday inclusion, make small changes in our day-to-day work, and make workplaces spaces in which people feel able to be themselves. Jess also highlighted the social model of disability emphasising the importance of creating adjustable, flexible environments that can be adapted as needed. Jess’ calls to action perfectly set up a big theme of the day: inclusion as an ongoing, never-ending process of removing barriers that takes attention and commitment every single day. We also used the day to start sharing and developing ideas around a Manifesto for Musical Inclusion and Social Justice. This is something we are working on to explore and dig deeper into what inclusion and social justice are, and how they manifest within our practice backed up with practical examples, training and resources. If you are interested to find out more then take a look here. We’d love to hear your thoughts.